You’d have to have the imagination of a Labour Party spin doctor to deny Peterborough United were worthy winners at old foes MK Dons yesterday (August 27). Indeed Jeremy Corbyn would have declared stadium;mk to be ‘ram-packed’ for the visit of Posh even though vast swathes of empty seats were a realistic indicator of the mood in the home camp. Dons haven’t won at their impressive, yet over-sized, home for almost six months and never looked like ending that run once falling behind in the second minute as Posh continued their own renaissance under the management of Grant McCann. The work already done by the rookie boss in seven matches this season is most encouraging. 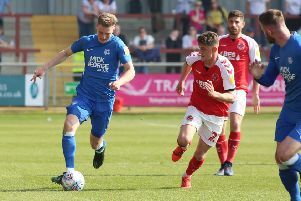 Posh have ended their Tuesday jinx, shown an ability to play well in more than one formation, signed players who look ready to compete at the top end of League One, found another teenage superstar and started to beat sides expected to challenge for promotion. The 5-1 thrashing of Millwall hinted at that, and for all their limp, witless play yesterday, Dons should become a top side at this level once they get new striker Kieran Agard fit and firing. McCann already has his boys buzzing. From 39 year-old Mark Tyler in goal, through 17 year-old Leo Da Silva Lopes in midfield (the teenager was born four years after the goalkeeper made his Posh debut) to assist-king Marcus Maddison, all performed with passion, style and gusto yesterday. Even the substitutes look decent, particularly smooth-running Callum Chettle who is proving Graham Westley’s forays into the lower reaches of non-league football weren’t all foolhardy. Maddison created both goals with perfect set-piece deliveries. Left-back Andrew Hughes poked home a nerves-settler from close range early on - it was his first goal for two years - and George Baldock headed the second powerfully into his own net 20 minutes from time. Baldock was subsequently named the home side’s man-of-the-match which sort of proves how poor the rest were. In between the goals, and indeed after the scoring had been completed, Posh controlled the game thanks to a solid defensive display, the excellence of central midfielders Chris Forrester and Da Silva Lopes and the tricky running of their forward players, In short McCann has his side playing effectively as a team, one that the club’s fans must hope remains intact beyond Wednesday’s (August 31) transfer deadline. Posh midfielder Leo Da Silva Lopes glides past Samir Carruthers of MK Dons. Photo: Joe Dent/theposh.com. Over 2,000 of them turned up to sit among the dark, threatening clouds yesterday. It’s a fixture that always brings out the best of them no matter the scoreline - they were arguably less noisy yesterday than on their last humbling visit 18 months ago when a 3-0 defeat led to the sacking of the most successful manager in the club’s history. MK Dons boss Karl Robinson is the manager under threat now. His team were booed off at half-time and at the end and his post-match assertion that his team were ‘unlucky’ was a head-scratching moment to the less blatantly partisan. Only once did they cause Tyler any problems when midway through the first-half Nicky Maynard defied calls for offside and squared to Daniel Powell whose first-time shot from the edge of the area was parried to safety by the veteran quite superbly. Otherwise most attacks, once right-back Michael Smith had got to grips with Powell, floundered on a well-organised and disciplined back four which featured another display of great power and bravery from Michael Bostwick, much-improved decision-making and positional awareness from Jack Baldwin and a strong-running effort from Hughes. But Posh really caught the eye with their cool passing in tight areas which helped them dominate possession, particularly in the final hour of the match. Da Silva Lopes showed such skill and composure it’s a fair bet Barry Fry’s phone will be red hot in the next few days, while captain Forrester’s work in the second half made a mockery of Ireland’s international scouting network. Forrester’s quality created headed chances for Gwion Edwards and Tom Nichols in the second-half, the first of which was well-saved by David Martin. The Dons’ keeper showed even better form in the final minute when thwarting Maddison and Chettle in quick succession after a rapid break out of defence. Clear-cut chances were hard to come by - Maddison’s regular long-range shooting caused Martin few alarms - but that didn’t stop McCann hailing his team’s performance as ‘perfect’. That might be pushing it, but it was certainly an all-round display that suggested the club’s downward spiral since departing the Championship in 2013 is about to be corrected. Posh: Mark Tyler, Michael Smith, Andrew Hughes, Jack Baldwin, Michael Bostwick, Chris Forrester, Leo Da Silva Lopes, Gwion Edwards (sub Jermaine Anderson, 90 mins), Marcus Maddison, Paul Taylor (sub Callum Chettle, 74 mins), Tom Nichols (sub Shaquile Coulthirst, 85 mins). Unused substitutes: Dion Curtis-Henry, Ricardo Santos, Jermaine Anderson, Jerome Binnom-Williams, Deon Moore. Goals: Posh - Hughes (2 mins), Baldock (og, 71 mins). Cautions: Posh - Taylor (foul). MK Dons - Walsh (foul), Downing (foul), Lewington (foul).